Caring for multiple dogs is easier if you split the duties. Taking proper care of dogs and puppies requires commitment. There are many duties, both daily and intermittent, that can be taxing when they all fall on one person. Dividing up duties so no one person is responsible for everything makes owning multiple dogs more manageable and enjoyable. Regular vet care is important for every dog. Puppies require more frequent visits, because of the need for multiple immunizations, but adult dogs require annual exams and vaccinations at the least. Knowing the hours of your local vet makes it easier to decide which household members should make this their responsibility. Keep license and identification tags up-to-date. Check with your vet to see what immunizations are required for puppies, and keep these up-to-date. A call to your municipal building will let you know what licenses and tags are required for adult dogs. This is probably a good job for the person who regularly handles the bills, as it is time- and paperwork-sensitive. Feed your dogs a healthy diet on a regular schedule to keep them looking and feeling their best. Puppies will require more frequent feeding than adult dogs; a young puppy may need to eat three or four times a day. Adult dogs are often fed once a day, but breaking the meal into breakfast and dinner is an option many dogs appreciate. Anyone in the house may be able to take this job on; just make sure someone is doing it at a consistent time each day. Exercise is probably the most important thing you can do to keep your puppies and dogs happy and well-behaved. Everyone in the house should participate in exercising the pets, not only because it is enjoyable but because it provides valuable bonding time. Exercise might include walks, fetch and games such as tug-of-war. While your puppies and dogs may enjoy playing together, you'll need to supervise these sessions, as puppies may test adult dogs' patience. Regular grooming keeps dogs and puppies looking and smelling good, and it allows you to notice any changes that may be early signs of illness, such as smelly ears or hair loss. Grooming most breeds requires no more than brushing in front of the television each evening. Start regular grooming at a young age and your puppy will come to look forward to this regular time together. 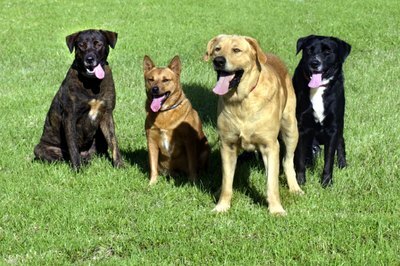 Training your dogs, regardless of their age, is responsible pet ownership. While one person may have more interest in training than others, everyone should work with each pet enough so your dogs and puppies know that every human member of the family must obey all people.